In one case, you’ve got Isaiah Austin who wants to run up and down a court, exercise, and do whatever else it is that basketball players do. Then, on the opposite side of the same Marfan syndrome coin, you’ve got Austin Carlile, who has ‘overcome’ his condition to become a literal rockstar but has had multiple surgeries and is currently fighting with his health. In general, most people living with Marfan syndrome should exercise regularly through low-intensity, low-impact activities adapted to meet their specific needs. They should avoid contact sports because of the risk of damaging the aorta and injuring the eyes. Strenuous activities, such as competitive sports and weightlifting, also should be avoided because of the stress placed on the aorta. For many of us, we fall into some not-so-happy medium between Austin and Isaiah. Some of us have had aortic dissections, while some of us only have a mild dilation. Some of us experience crippling scoliosis, joint pain, or problems with our eyes. Others just seem to be incredibly tall and skinny. This is the “beauty” of Marfan - it is a spectrum condition. Naturally, we want to see someone who represents our own experiences, our own body type, our own health conditions. We look to people like Isaiah and Austin as figureheads for this condition because they’re famous, they’ve got our condition, and they’re awesome, right? But when we see Isaiah re-enter the basketball world, we pull back a bit. “That doesn’t represent me - I’m not that lucky.” I’m guilty of it myself. “He’s not a role model for the community,” I thought yesterday. But then I took a step back and evaluated - If he wasn’t a role model for the community, then how are we going to finally respect that Marfan is not a one-size-fits-all condition? Sure, it’s a little scary to worry if someone is risking their health, but we don’t know his specific situation. Then we see Austin struggle with - what I can only assume is - difficulties with his heart, his bones, his eyes, all while trying to entertain his massive OMM following. But we also see a rockstar - we aren’t rockstars! Sometimes, we can’t even get out of bed! This leads to even further concern that nobody in the Marfan spotlight represents you or me. Who do we have to look to? Who do we have to share our woes and delights with? I get it. I feel that, too. But the thing about this condition is that we are physical manifestations of how different we all are - and yet, we all have this one thing in common. We can be rock stars, singers, teachers, accountants, writers, chess players… the list just goes on and on for every person that makes up the Marfan community as a whole. It’s also really important to recognize that we are all spokespeople for the Marfan community. The more people we have talking about this condition, the more awareness we spread and the more lives we save. I hope, for Isaiah Austin’s sake (and for the Marfan community at large), that this re-entrance into the basketball world bodes nothing but great things. I also wish Austin Carlile well, and that he gets the rest and care he needs. As for the rest of us, let’s start sharing our own experiences. 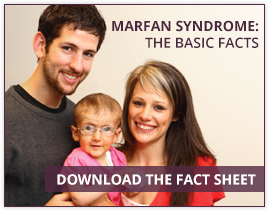 We don’t have to be basketball players or rock stars to make Marfan syndrome visible.